Protect and enhance your exterior wood with TWP. "Total Wood Preservative" is a professional strength, easy to apply formula protecting and preserving all exterior wood surfaces. 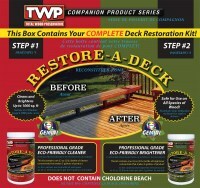 TWP 100 / TWP 200 / TWP 1500 series are EPA registered wood preservatives and rated #1 in leading consumer magazines. TWP 200 Series is Canada Compliant!